Are you the kind of person that must have something spicy with every meal, even if it’s the middle of the night and all you have at home is a pack of plain pasta? 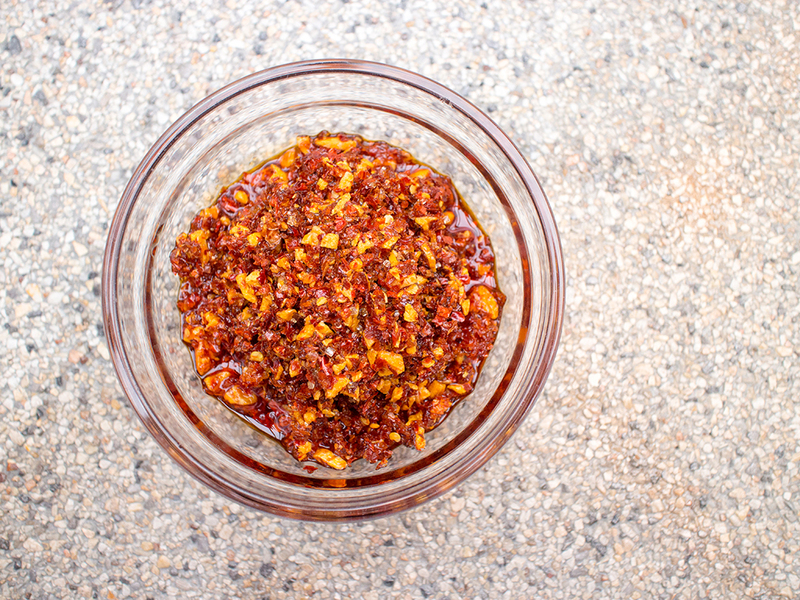 Fret not, our crispy chili oil recipe is here to save the day. Made with a few simple ingredients, crispy chili oil is the perfect accompaniment to just about everything savoury you feel like eating – be it steamed fish, chicken soup, a fancy poké bowl or even instant noodles. 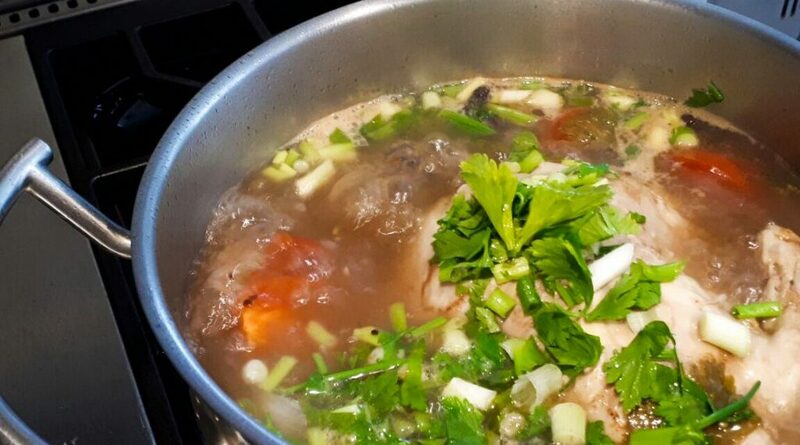 Just a teaspoonful or two will turn that mild meal into something you can really sink your teeth into. And if all you really have is pasta, boil it up and toss it with crispy chili oil for a spicy, tasty meal that’ll leave a tingle on your lips and tongue. 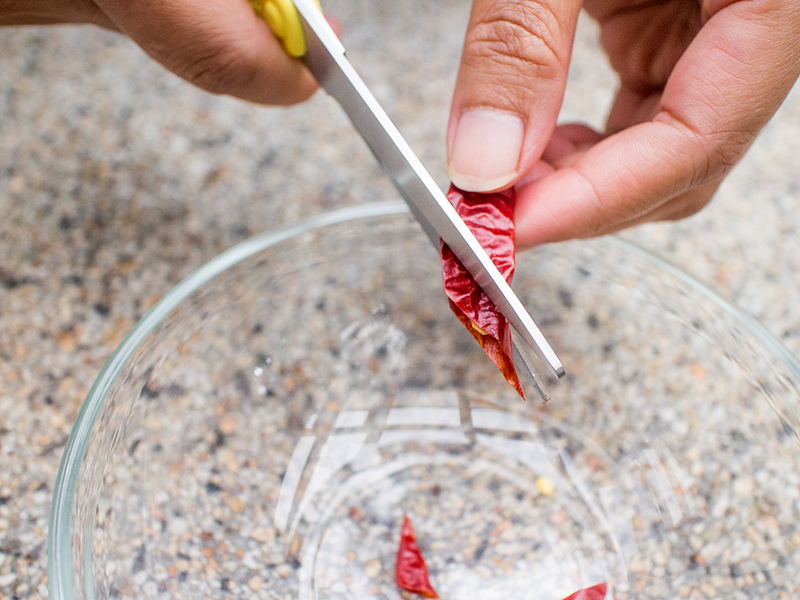 Use a pair of scissors to cut dried chilies into small strips. 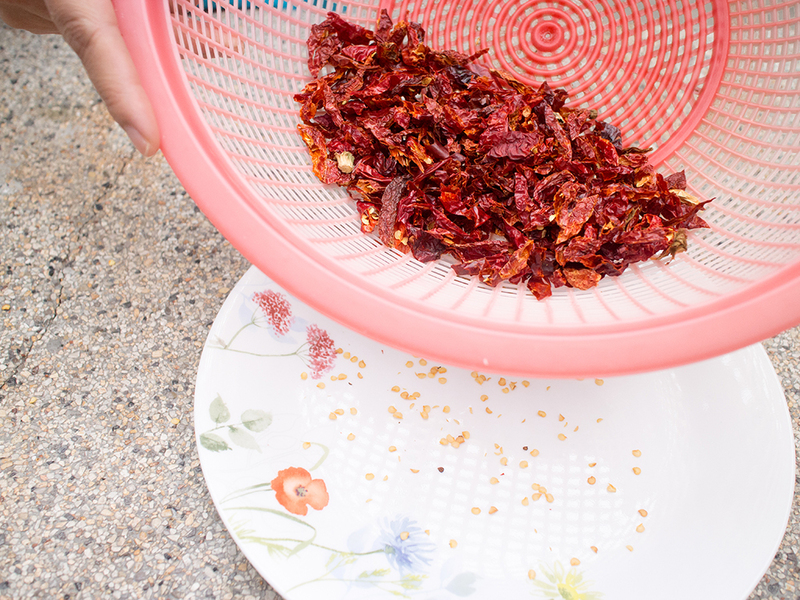 Put cut dried chilies into a colander or basket with small holes and shake until most of the seeds have been removed. 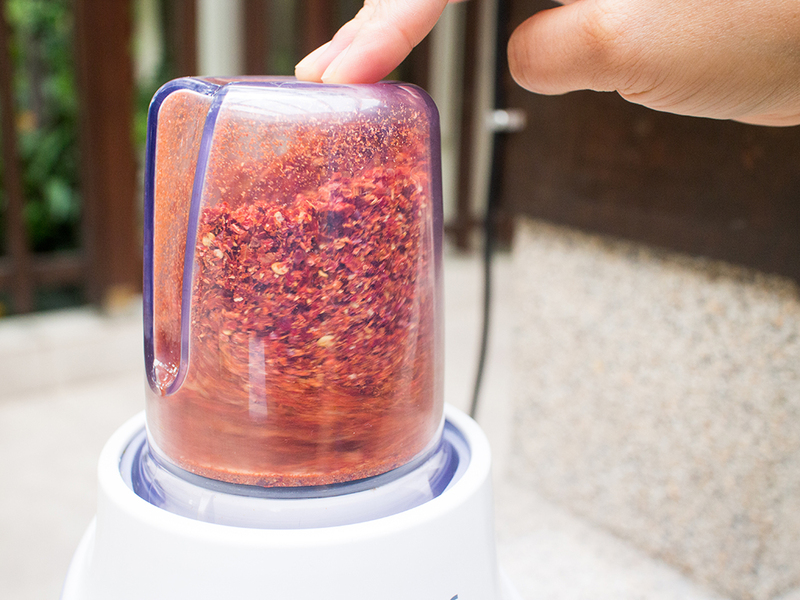 Transfer deseeded dried chili pieces to a blender and blend until fine and flakey – like chili flakes. 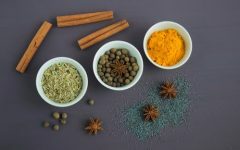 Don’t blend it too fine – you don’t want chili powder. 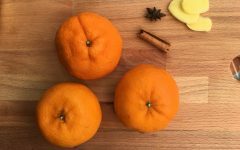 Use the small container for your blender, or a food processor. Mince garlic by smashing each clove with the flat part of your knife and then mincing it coarsely. 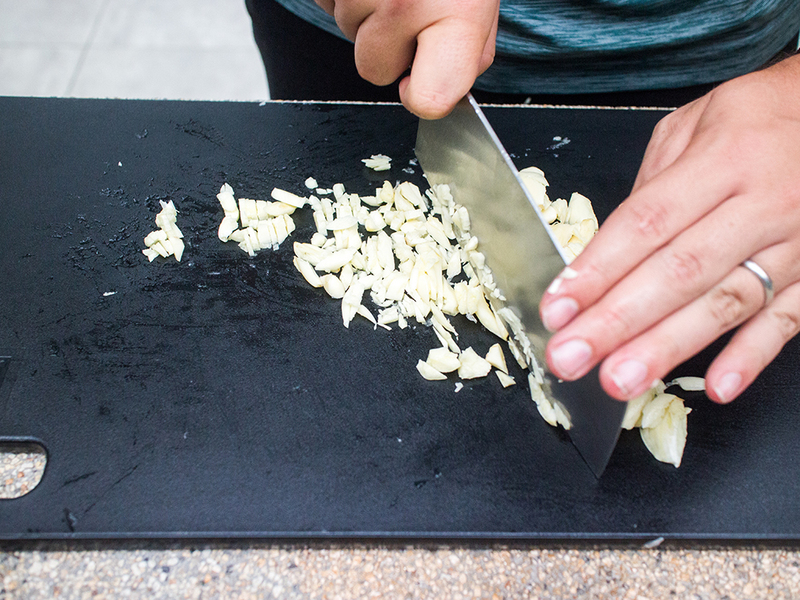 Use a cleaver to get more garlic smashed and chopped in one go! 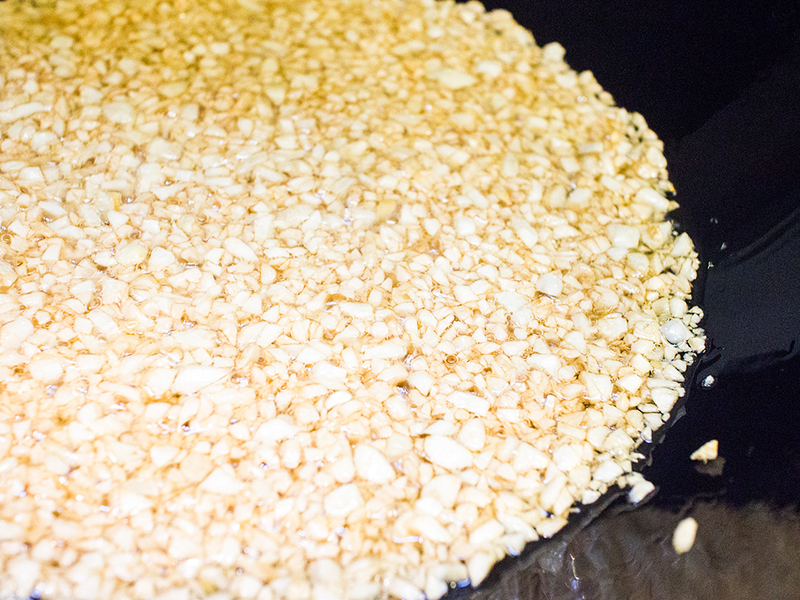 Heat cooking oil in a wok until it reaches 150°C or until it is almost ready for frying. Add garlic. 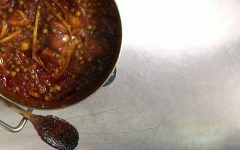 The temperature of the oil will drop to about 95°C. 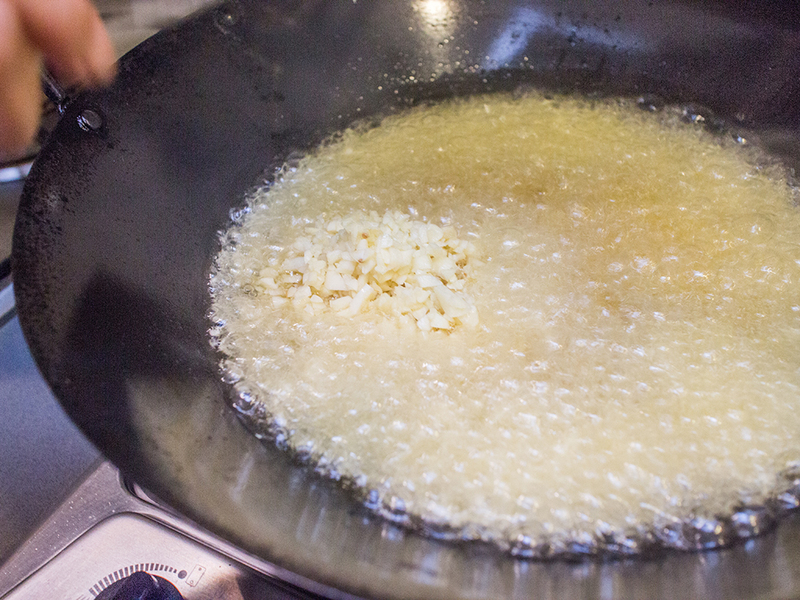 Stir continuously to fry the garlic until it’s a light golden brown, about 8 to 9 minutes or until the oil reaches 130°C. Scrape the sides and bottom of the wok so nothing sticks. Add chili flakes and continue to stir for 2 minutes. Next, add salt and sugar and stir to combine, scraping down the sides and bottom of the wok as you stir. Fry for 1 minute. Your crispy chili oil is ready! 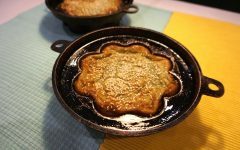 Let it cool before serving or storing. 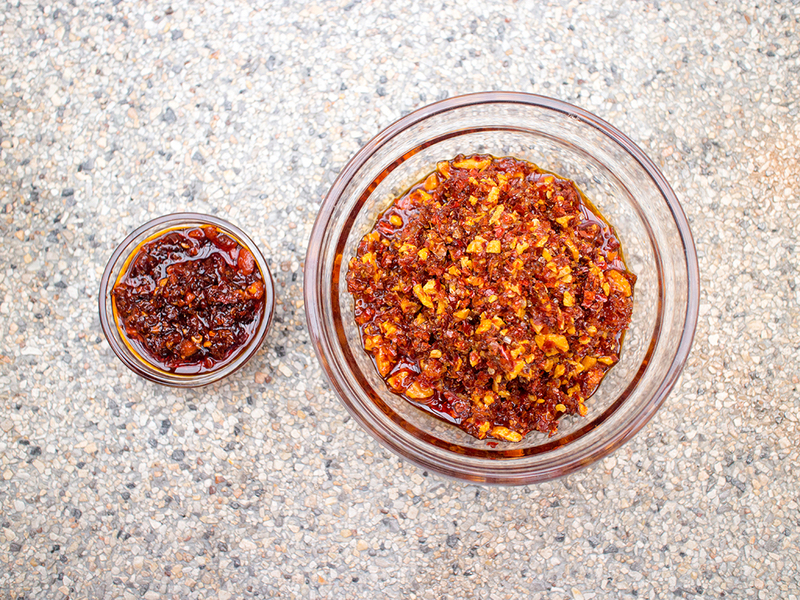 Make a big batch of crispy chili oil as it can be kept for a very long time. 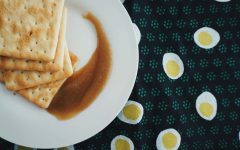 Because it lasts almost forever, this is a great recipe to bring with you if you’re studying or traveling abroad and absolutely need something spicy in your meals. Just be sure to pack it really well as you would not want it to spill all over your clothes! 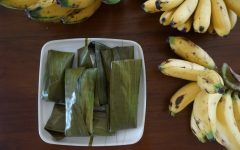 Let cool completely before storing. Air tight containers like jars are best for keeping the oil in. Store in a cool dry place. Do not refrigerate. Don’t forget to scoop in the oil too. It’s not meant to be discarded. 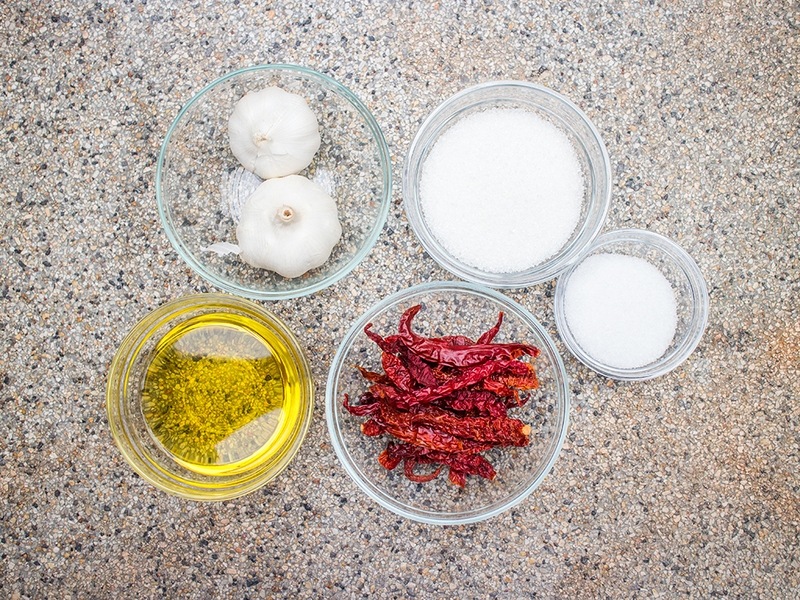 If you plan to make and store crispy chili oil, make sure the garlic is thoroughly cooked. 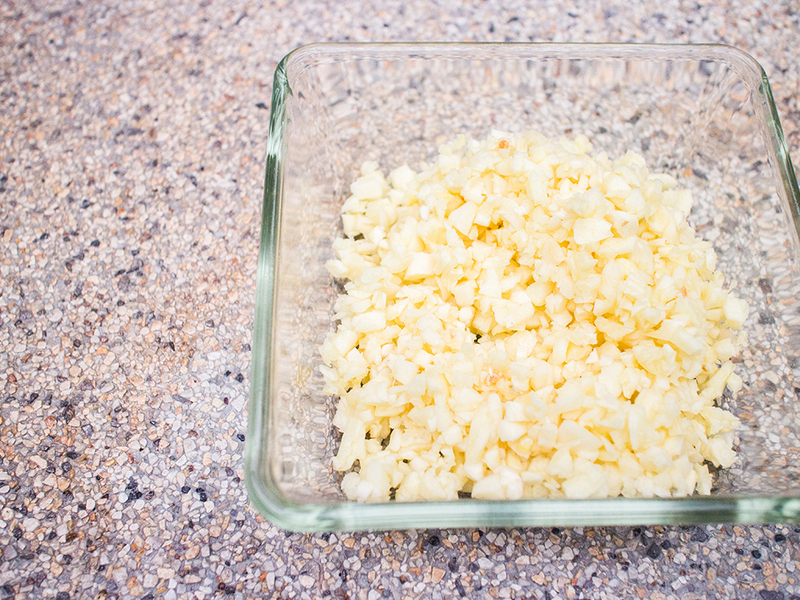 Raw garlic stored in oil can cause botulism and make you very, very, very sick. The longer you keep your crispy chili oil, the darker its colour will be. What did you eat your crispy chili oil with? 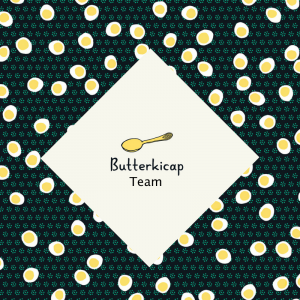 It goes so well with just about everything! Show us your pictures by hashtagging us with #butterkicap.